Manual and Automated Vacuum Lifters & Systems. 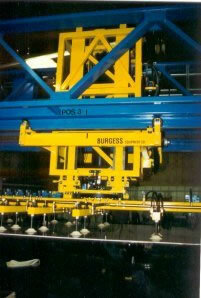 Burgess Manufacturing Company is a manufacturer of Standard & Custom Built Vacuum Lifting Equipment. We fabricate vacuum equipment from one man below-hook manual lifters to fully automated sheet handling applications. We manufacture Vacuum Lifters, stackers, storage and retrieval units and associated hardware. We also supply replacement parts for our equipment as well as other manufacturers, including companies no longer in business. We offer a comprehensive line of manual lifters and also engineer and build vacuum equipment and systems per application, whether that be fully automated vacuum lifting systems or one pad self-contained lifters. 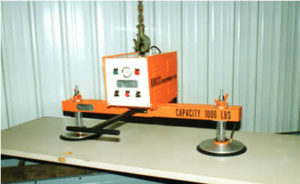 Our vacuum lifter systems separate, lift and place glass, metal or plastic sheets. Burgess Manufacturing Company is a specialist at analyzing material handling problems, designing and building specialized equipment to reliably and efficiently overcome these problems. Burgess Manufacturing has years of experience in maximizing your throughput and system reliability while minimizing your investment. For examples of vacuum lifters, vacuum lifting and sheet handling systems designed and built by Burgess Manufacturing Company please explore our Products.. If you have a present application that requires a proposal, please contact us with your specifications and we will be glad to work up a formal quotation complete with proposal drawings. © 2019 Burgess Manufacturing Site by RMS Services, Inc.